bench is now available on CRAN! The goal of bench is to benchmark code, by tracking execution time, memory allocations and garbage collections. bench::mark() will throw an error if the results are not equivalent, so you don’t accidentally benchmark non-equivalent code. Results are easy to interpret, with human readable units in a rectangular data frame. By default, the summary uses absolute measures, however relative results can be obtained by using relative = TRUE in your call to bench::mark() or by calling summary(relative = TRUE) on the results. ggplot2::autoplot() can be used to generate an informative default plot. This plot is colored by GC level (0, 1, or 2) and faceted by parameters (if any). 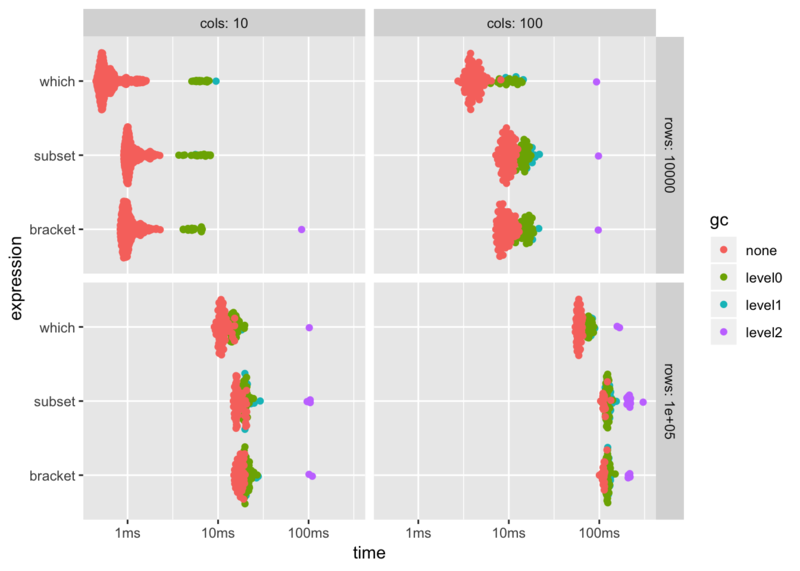 By default it generates a beeswarm plot, however you can also specify other plot types (jitter, ridge, boxplot, violin). 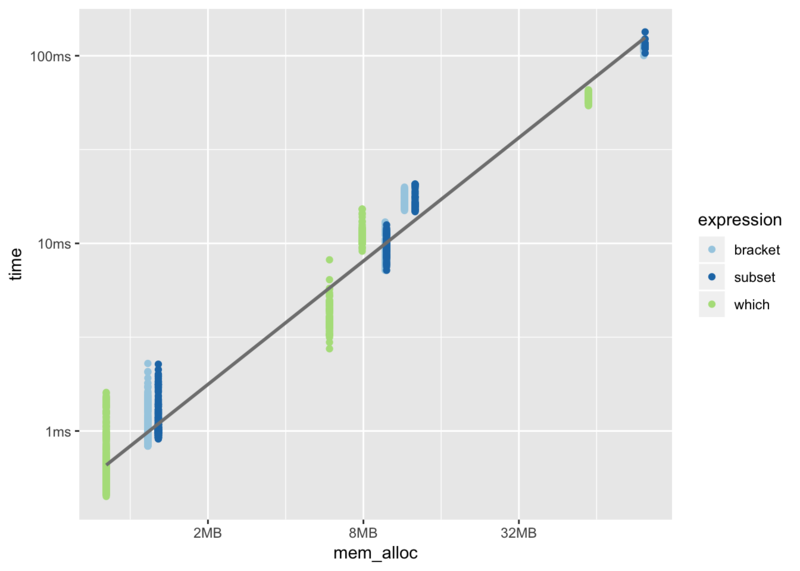 See ?autoplot.bench_mark for full details. This gives you a nice overview of the runs and allows you to gauge the effects of garbage collection on the results. You can also produce fully custom plots by un-nesting the results and working with the data directly. In this case we are exploring how the amount of memory allocated by each expression interacts with the time taken to run. Compared to other methods such as system.time, rbenchmark, tictoc or microbenchmark we feel it has a number of benefits. Uses the highest precision APIs available for each operating system (often nanosecond-level). Tracks the number and type of R garbage collections per run. Verifies equality of expression results by default, to avoid accidentally benchmarking non-equivalent code. Runs expressions in batches and calculates summary statistics after filtering out iterations with garbage collections. This allows you to isolate the performance and effects of garbage collection on running time (for more details see Neal 2014). Allows benchmarking across a grid of input values with bench::press(). When the development version of bench was introduced a few people expressed concern over the number of dependencies in the package. I will attempt to explain why these dependencies exist and why the true load may actually be less than you might think. While bench currently has 19 dependencies, only 8 of these are hard dependencies; that is they are needed to install the package. Of these 8 hard dependencies 3 of them (methods, stats, utils) are base packages installed with R. Of these 5 remaining packages 3 have no additional dependencies (glue, profmem, rlang). The two remaining packages (tibble and pillar) are used to provide nice printing of the times and memory sizes and support for list columns to store the timings, garbage collections, and allocations. These are major features of the bench package and it would not work without these dependencies. The remaining 11 packages are soft dependencies, used either for testing or for optional functionality, most notably plotting. They will not be installed unless explicitly requested. The microbenchmark package is a good alternative for those looking for a package with only base dependencies. We hope bench is a useful tool for benchmarking short expressions of code. Please open GitHub issues for any feature requests or bugs.